The Grit Fluxx Mini 2017 Scooter in Black and Silver Laser has arrived. 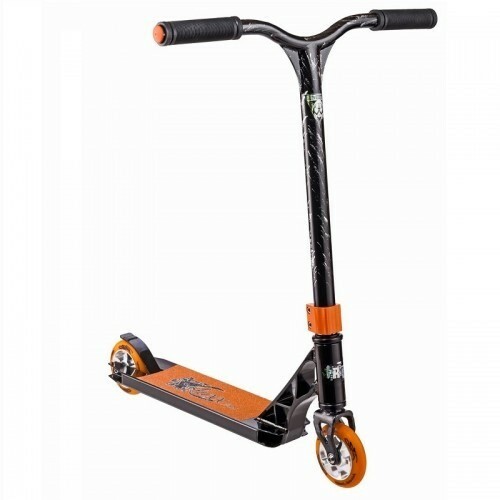 The Fluxx mini is essentially a shrunken down version of the normal Fluxx making it ideal for younger or smaller riders who still want a quality scooter. The difference is the deck is shorter at 431mm long and the bars are lower at 500mm high. Key features include a new 6061 heat treated triple channel alloy deck with skeletonized down for extra strength and less weight. There is also new stronger hi tensile gusseted riser handlebars, new alloy cast core 100mm wheels and new alloy double clamp.